Anyone think that orange team from Knoxville can beat that orange cow college? Auburn is the better team, but they may have checked out. The Boogs may have checked out, but I doubt it. Boogs have a way of cheating winning at home. Expect them to get the refs they beeched about in Starkville to help them this week. I think I posted several weeks ago that they are looking at a 7-5 type year. Right now that looks like the best case scenario. They already lost 2 games and looked horrible in the process. Auburn still plays aTm, UGA, and Bama. That's 3 more losses. They will probably beat UT, but Ole Miss is a toss up. So it is looking like 7-5 most likely for them, with a good chance of 6-6. I have no idea why the idiots in the polls still have them ranked right now. They are ranked 21 with aTm at 22 in both polls. Totally absurd. The same idiots have UK at 18 and 20 even though they just lost to aTm. UK is probably about right but aTm is more like 10 to 15. Auburn should not be ranked at all. They shouldn't be ranked. But neither should the Big 10 and 12 teams! Just delicious watching the Boog meltdown, and how they blame Malzahn, Stidham, and the refs. They need a mirror!! At least the Toomers trees are safe! "Well, I mean it's impossible to create it if hasn't happened in a game. I think there's some things that we do in practice, especially always trying to practice situations, end-of-the-game situations -- need a field goal, need a touchdown, this much time's left, when do you clock the ball, when don't you clock the ball, how do you take the air out of it if you are ahead and it's a close game. So, we practice those things, but until you have to do it in a game, you never know quite how ready you are for it. It hasn't happened yet, but I'm sure it will happen at some point this season." Yes sir in the NCG or the SECCG. RTR! What about our kicking game? ?? Bulovas is missing FG's which scares me because will he miss a big one down the line to keep us from proceeding further? RTR! Seems we keep getting kickers that are head cases. They must also transition from a block to off the ground on field goals and PAT's. I have NO IDEA how a college kicker can miss extra points. There are MANY high schools that haven't missed kicks in several years. Seriously, it's probably difficult to kick in college, because it has to be quick and the kick must be high. But we used to take turns kicking field goals during high school football practice; just for fun. My buddy was pretty good at kicking soccer style, even though our regular kicker was straight-on kicking. It's just not that hard, especially straight on with a square-toed shoe. Hidden in the above response I mentioned the kickers must transition from using a block to kicking off the ground on FG/PAT's. I remember Colt David going to a one inch block his Sr. year which made the transition easier. They couldn't beat Rutgers right now, IMO. But maybe they will give the boogs a tussle. I think Ga will beat LSU but it will be close. I think LSU used up all their luck in Lee County. Close? 7 points or more/7 or fewer?? Ga by about 8.5 points. RTR! "Missouri will be without one of its top playmakers against Alabama on Saturday. Senior wide receiver Emanuel Hall, one of the top deep threats in the SEC, won't play versus the Crimson Tide, Missouri coach Barry Odom said Wednesday." 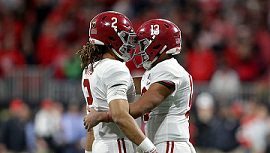 -- Saban said quarterback Tua Tagovailoa has a sprained knee but that he took every rep he was supposed to take in practice. -- Saban said guard Lester Cotton has a sprained ankle and added there is hope the left guard will return to practice Thursday. Tua looked gimpy against Arky. I was surprised how well he threw passes right after that. Here's hoping we sprint out to another big lead and get Tua and Lester some rest before halftime. Mizzou gave up 37 (if I remember correctly) points to USCe. We’ll have that before halftime.